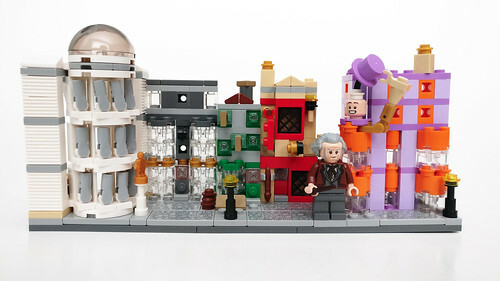 Starting this week, LEGO will be releasing the LEGO Harry Potter Diagon Alley (40289) as a gift-with-purchase set at LEGO Stores and on [email protected] It will be available from November 9-21 with purchases of $99 or more, while supplies last. 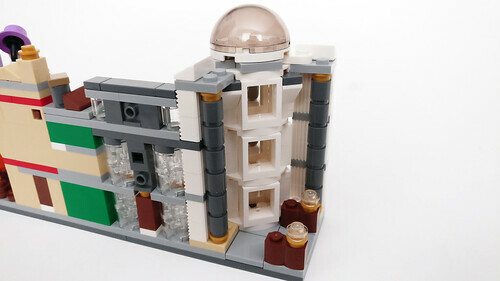 This set has 374 pieces and it is the same microscale as the Hogwarts Castle (71043). 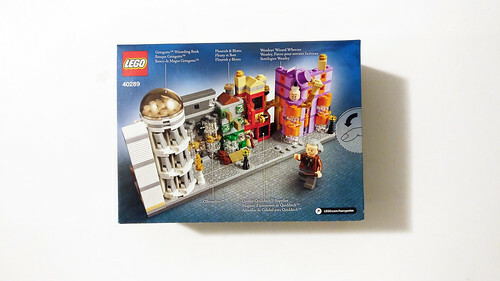 The back of the box shows us some of the shops that are at Diagon Alley including Gringotts Wizarding Bank, Ollivanders, Flourish & Blotts, Quality Quidditch Supplies, and Weasleys’ Wizard Wheezes. 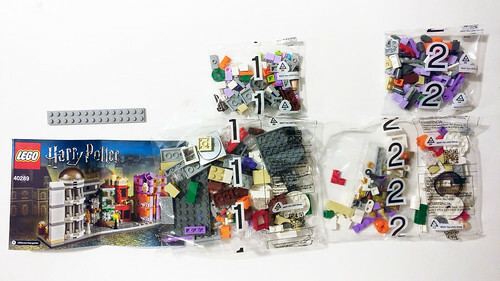 The contents of the box include four numbered bags to two, a loose 2×14 gray plate, and the instructions. 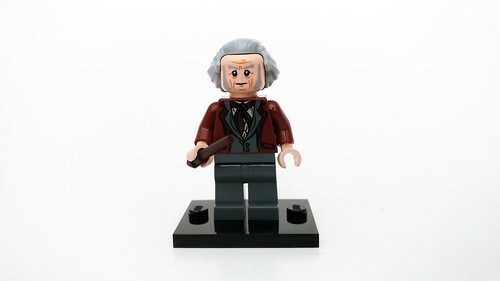 This set includes an exclusive minifigure with Mr. Garrick Ollivander. The torso has printing of his brown jacket with a gray waistcoat and a scarf. The jacket printing extends to the back of the torso as well. He has a double-sided head with a normal look on one side and a scared, opened-mouth expression on the other. His hairpiece is a longer slicked back hairstyle. His accessory is a dark brown wand. 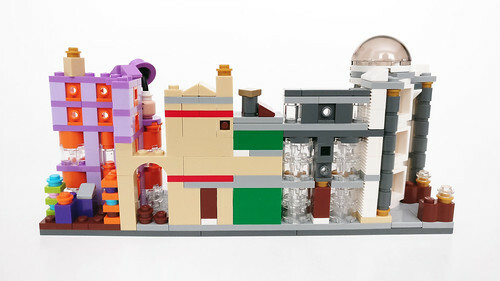 The Diagon Alley build starts off similar to the LEGO Architecture Skyline sets with the base of the street. 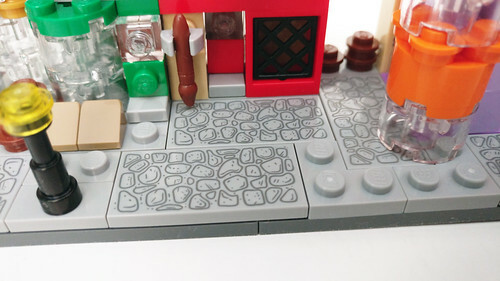 There’s nothing much going on here except the six exclusive 2×4 printed cobblestone tile pieces that are spread out on the street. 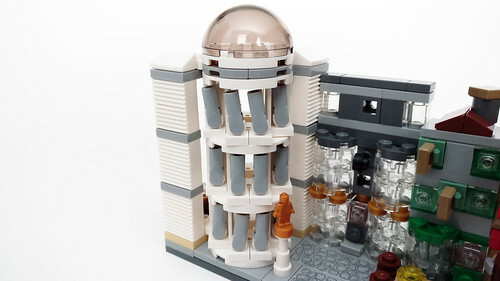 The Gringotts Wizarding Bank uses a turntable piece at the base to give it an angled look. To hold it in place, there’s a 1×2 rounded plate on the side. 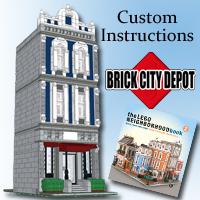 The columns on building are made using 3.2 shaft pieces on clips. 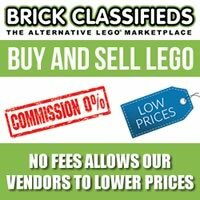 The glass roof is a trans-blak dome piece. The back side of Gringotts has a couple of desks with lamps on top. 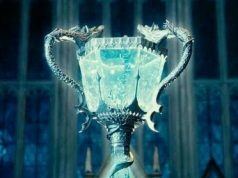 Lastly, there’s a golden statue at the entrance to represent Gringott. Next up is Ollivanders wand shop. There’s nothing much going on here except for the front windows which use some trans-clear 2×2 round bricks on either side of the door. Flouris and Blotts is the bookstore that has the green and gray color scheme on the building facade. There are a couple of signs that are on the plate clips but I don’t think I’ve seen any hanging signs on the building. 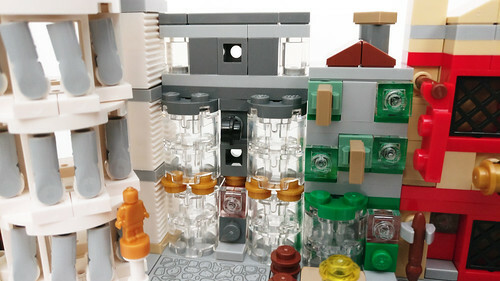 This is considered an illegal building technique but since LEGO is using it in this set, is it legal now? 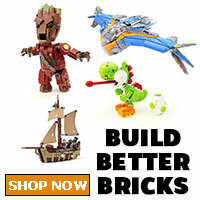 Quality Quidditch Supplies has a red color facade and the windows use the black bar frame windows. There’s a couple of hanging signing as well as a clipped brush which represents a broomstick. 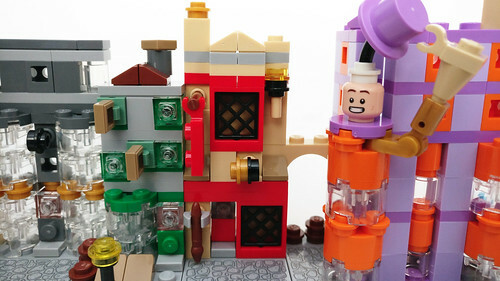 The last building is Weasleys’ Wizard Wheezes and it is the most detailed one in the set. 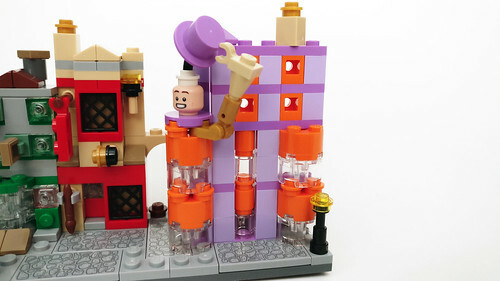 The thing here that your eyes immediately go to is the large Weasley twin on the front of the building that lifts his hat. 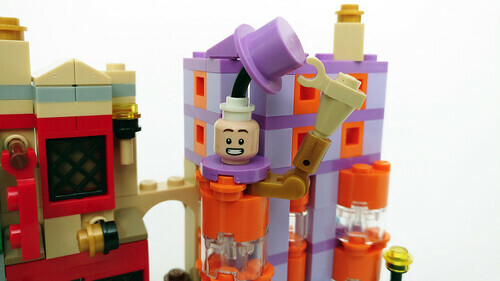 Surprisingly, it uses Robin’s head without the glasses and it has a wide smile on one side and a confused look on the other. 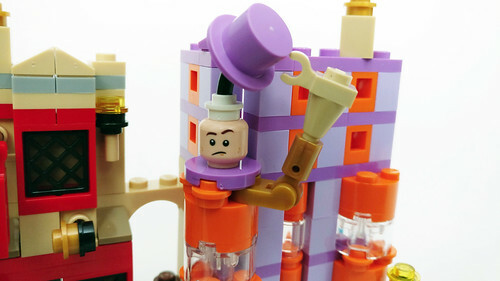 It uses a black hot dog piece to give the hat the curved look. 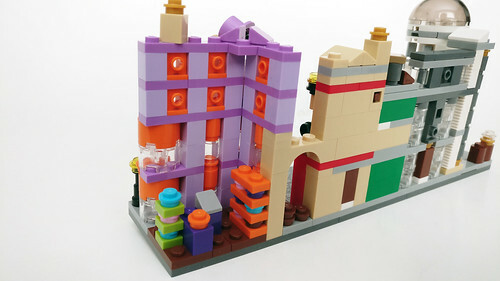 The building is lavendar and orange colored with the windows using some fairly rare orange headlight bricks. The back of the building has shelves full of products. 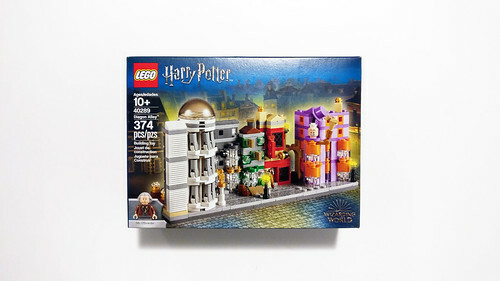 If you’re a LEGO Harry Potter fan, there’s no question if you want to pick up the LEGO Harry Potter Diagon Alley (40289) or not. 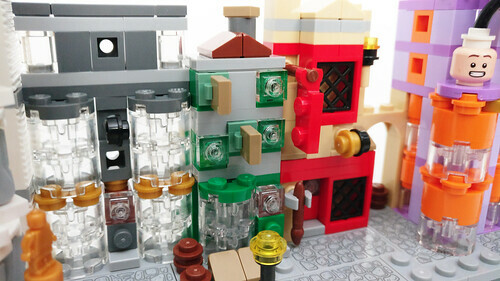 It’s a pretty fun build to pass the time but the details are somewhat limited because it is in the microscale scale. 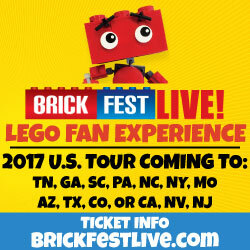 That doesn’t mean there aren’t details with the set. 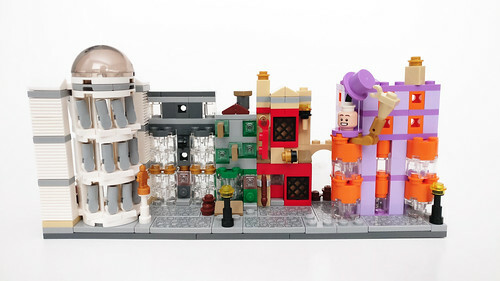 For me, the best one is in front of Weasleys’ Wizard Wheezes and the printed cobblestone tiles. 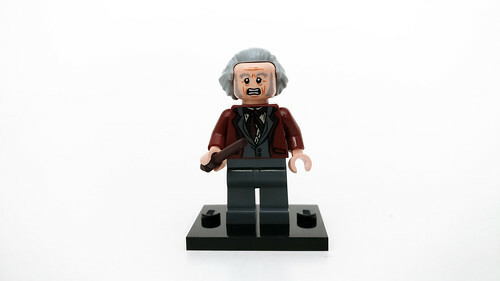 The exclusive minifigure of Mr. Ollivander is also a bonus. Again, this set is a gift-with-purchase of $99 or more starting this Friday, November 9 until November 21, while supplies last. 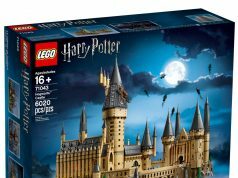 Remember there is a double VIP point promotion currently going on for the Hogwarts Castle (71043) so it’s not a bad time to pick it up then.